Pvc flannel back table cloth with 3 inch lace, Water stains wipe with a damp cloth, oil stains with a few wipes detergent can be wiped, you can clean as new. All liquids, even wine, bead up can be quickly wiped clean with a sponge or napkin. Keep your table clean, giving you a comfortable dining experience. Looking for ideal Flannel Back Table Cloth with Lace Manufacturer & supplier ? We have a wide selection at great prices to help you get creative. All the Non Woven Back Table Cloth are quality guaranteed. 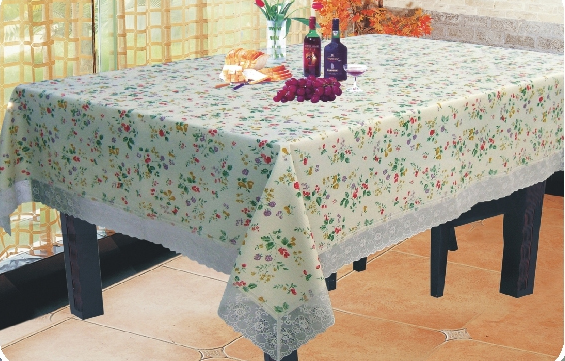 We are China Origin Factory of Tnt Table Cloth with Lace. If you have any question, please feel free to contact us.